Summit View emphasizes the appreciation for all arts and the enrichment they provide in school and beyond. In this course, students undertake art production activities to develop projects in two and three dimensional art media. Art appreciation and art production are linked throughout this course as students research, develop, and create around concepts that relate to the world around them. In this way, the creation of art is used to explore thoughts, events, and ideas. Instruction is provided in technique and the processing of materials into final artistic form. 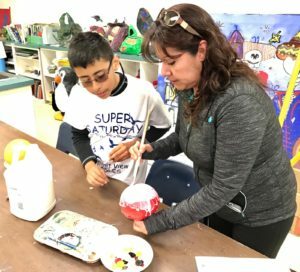 Students work with different media to create basic sculpture, murals, drawings, and paintings. This course is designed to introduce students to the various elements of music through understanding and analyzing its artistic value, creative expression, historical and cultural context, aesthetic values, and applications. Students learn to read, notate, and perform music for keyboard or vocal scores of up to 2 staves. They also learn to sight read and vocally perform solfege accurately at a basic to moderate level. Students will use ear training and rhythm exercises to notate simple melodies and harmonies, recognize major and minor keys, listen for and analyze the use of musical elements and expressive devices, and identify the use of form representing musical diversity. Students also understand and analyze the role of historical and cultural influences and how they relate to the composer, musician, and audience. Students will learn to assess music critically through developed criteria. Finally, students apply music across the curriculum to demonstrate their competency in understanding the role and relationship music has to other subjects and careers. Our theater program offers a school-wide musical each year. Auditions are held for anyone interested. The 2014-2015 Spring Musical at Summit View West was The Wizard of Oz while the valley campus performed Damn Yankees. Each production had over 20 participants. 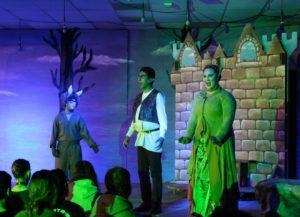 Our theater program is a wonderful outlet for our student body and helps to build self-confidence and better communication skills.